Digitally printed stretch ceilings turn any room of your home or business into a work of designer art. 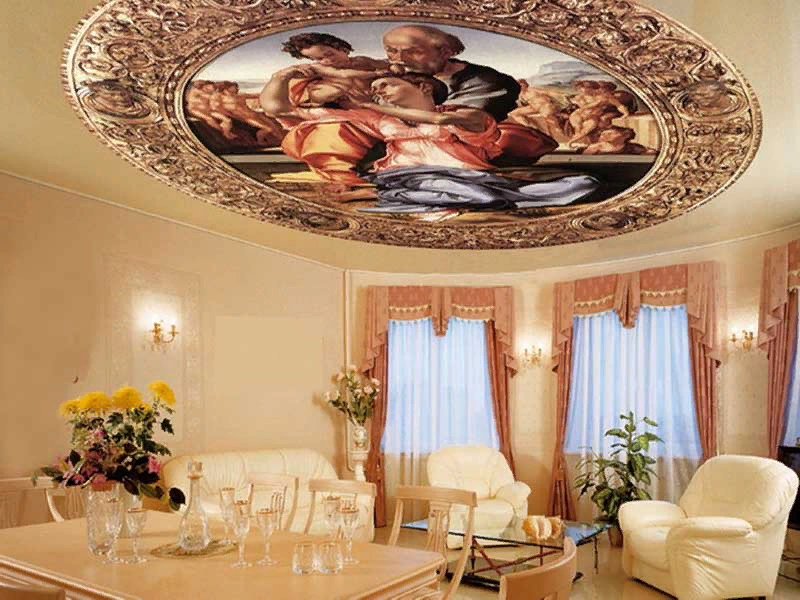 The possibilities are endless—giving you the option of enhancing your ceiling with reproductions of famous artists masterwork, or your own art or photographs using modern digital printing techniques on a stretch fabric ceiling installation. Versatility. Digitally printed stretch fabric ceilings can be installed in any kind of space, either residential or public. The mold and moisture-resistant material is even suitable for damp basements, bathrooms, or saunas. Easy Care. In the same way that caring for and cleaning painted or wall-papered walls is easier than caring for white walls, caring for printed stretch ceilings can be easier and less stressful than caring for a regular white stretch ceiling. Environmentally friendly and nontoxic. Only safe UV-ink is used to print images on the textile. The result is so non-toxic, you can confidently incorporate them in kid’s rooms or nurseries. Digital images can be printed on almost any material used to make stretch ceilings, including all types of PVC film and fabric. However, there are nuances for each type of stretch ceiling. PVC has width limitations, which means the pattern might have to be broken into separate segments. Seams in PVC film might also affect the visual perception of the image. For those reasons, we like fabric ceilings the best. It’s important to note that the texture of the fabric can affect the sharpness of the print when you view it from close quarters, so we prefer to use the fabrics with a smooth surface, such as MA200. An image can be applied on any surface finish: matte, glossy, or satin. Though in our experience, images look better on matte and satin ceilings. Glossy ceilings can distort the picture slightly. The choice of one type over the other also depends on the design concept and the image specifications. It’s worth consulting with a specialist on your design project if you’re in doubt. The choice of image is limited only by your imagination. Typically designers recommend you select art that corresponds with both the style and use of the space. And don’t overlook the fact that images and colors can affect our emotional state — for better or worse! For example, digitally printed ceilings in the kitchen can arouse your appetite and invite warmth and cheer into space. You can implement just about any design idea in the living room, from something avant-garde, colorful, or fantasy-like, to a more neutral picturesque landscape, floral arrangement, or seascape. In the bedroom, printed stretch ceilings can help create a peaceful and serene atmosphere—a starry sky is one of the most popular design solutions we see installed bedrooms. 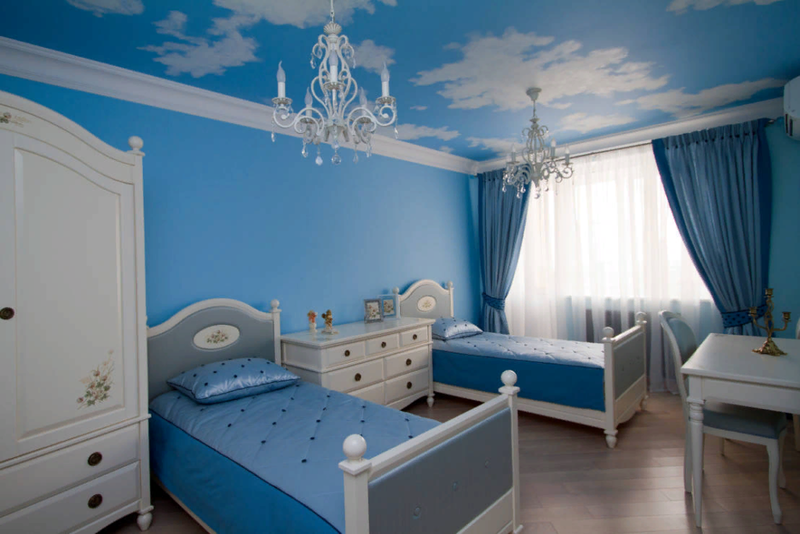 For a little playful fun, a child’s room might feature a scene from their favorite storybook on the ceiling or a wall. Essentially, digital images are applied to the substrate using a wide-format UV printer and special water-resistant inks. This technology allows for deep penetration of the color into the structure of the fabric so that the images remain just as bright and saturated many years later. The key is that the digital image is of the highest quality. Modern technologies make it possible to achieve correct color matching and image clarity that will last, on-demand. 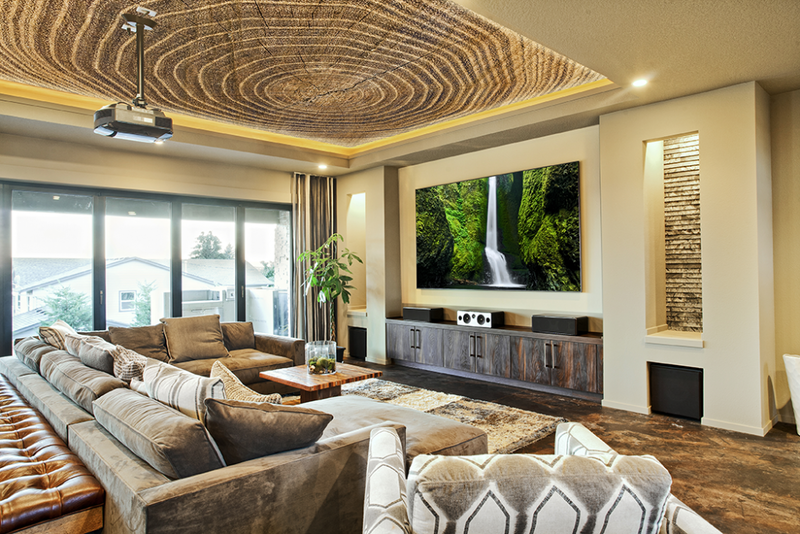 These same innovations have also made digitally printed ceilings more affordable than ever before. Printed stretch ceilings combine art with interior design, light, form, and function. It’s hard to imagine a more versatile tool in the designer’s toolbox and it’s exciting to bring spaces to life with this remarkable technology! We post our favorite and most inspirational printed stretch ceilings on our Instagram page. Follow us there to keep up with the latest trends in printed stretch ceiling designs. Fill out the request form to get a quote for YOUR Printed Stretch Fabric Ceiling! Tell us where you’re located and size of your ceiling and we’ll get back to you with a quote!